In honor of the recent wave of beautiful, warm weather here in North Carolina, I optimistically present a recipe for spring rolls. I've used these wrappers all of two times now and will admit that they are a bit...homely. I'm sure there's a better way to roll these than I've shown here. But I love the combination of the fresh vegetables, savory chicken and salty peanuts, and it's always fun to eat an Asian meal wrapped up like a Mexican burrito. I serve everything chilled or at room temperature. And for the little ones, I set aside the vegetables, chicken and pasta separately. Same meal Mom and Dad eat, just served differently. FREEZER TIPS: As long as you're going to the trouble to make these, double this recipe and put aside a second meal in the freezer for another week. Place half of the marinated chicken--uncooked or cooked--in a quart-sized freezer bag. Place 1/2 the pasta in a separate freezer bag. Staple the two bags together and place them in the freezer. The spring roll wrappers will keep in the pantry indefinitely. My Mom brought me these wrappers last Easter and I've just now worked up the nerve to use them. Thanks Mom for the inspiration! 1.) Blend together all the marinade/sauce ingredients with a whisk. 2.) Add 1/4 cup of peanut sauce to the cooked noodles along with some sesame seeds and sliced green onions. Stir with tongs to combine. Set aside. 3.) Add remaining 1/4 cup of peanut sauce to chicken and coat. Set aside to marinate 1 hour, turning halfway through. Grill chicken and cut into smaller strips if needed. 4.) Pour warm tap water into a 9"x13" pan. Place the spring roll wrappers one at a time in the pan, completely submerging them. Let stand until softened, about 30 seconds. 5.) Gently lift one spring roll from the water and drape across a dinner plate. Arrange chicken, peppers and carrots in the center of the wrap, then top with lettuce, peanuts and noodles. Season with soy sauce to taste. 6.) Close wrap by pulling two opposite sides together, overlapping to seal. Repeat with the remaining two sides. Flip and serve. Spritz cookies are usually a Christmas tradition, but the cookie presses these days come with heart and daisy disks that beg to be used for spring and Valentine's Day. Linc was my official decorator--for his usual handling fee in chocolate chips and sugar sprinkles. What can I say? Good help this cute is hard to find. As a special treat for Lincoln, I mixed up the usual spritz recipe to make it more like his favorite cookies from the grocery store bakery, a lemon spritz. I have to say, they're pretty darn close and don't have any of that nasty mystery ingredient greasiness. Not that these are health food by any means, with not one, not two, but THREE sticks of butter. Ah well. They're tiny. I'm sure five or six won't hurt. Much. 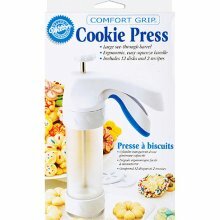 If you don't have any idea what I'm talking about when I say 'cookie press', here's a photo of one from Wilton for about $10. The model I have is very similar. Two tips to making this press and recipe work--don't grease the cookie sheets and don't chill the cookie dough until after they're pressed out onto the cookie sheets and decorated. Then stick them in the freezer for five minutes while you wait for the previous pan to bake. Freezing the dough once pressed will keep the cookies from puffing up and losing their shape. Also, don't re-use a baking sheet until it's cooled, cleaned with soap and water and dried. That way, the cookie dough will stick to the pan and release neatly. If you find your cookies are sticking to the disks, take a second to run hot water over the disk to get rid of any dough buildup, while it's attached to the press. You should get a nice, clean cookie on the next take. Don't worry, this will all make a lot more sense when you're actually using the press. :-) You can also try the chocolate version of this dough that's on the box (dipped in chocolate would be divine) or use food coloring to color the dough. Other cookie disks in my set include a pumpkin, Shamrock and Christmas shapes. A cookie press might look or sound complicated, but once you get the hang of it you'll be hooked. How else can you make this many adorable and yummy cookies? 1.) Preheat oven to 375'. 2.) Cream butter and sugar. 3.) Add egg, lemon juice and peel and milk. 4.) Add flour and baking powder, mixing to make a smooth dough. 5.) Drop dough in press by the spoonful, tapping against the counter to help get rid of air pockets. Press out cookies and decorate. 6.) Chill in freezer five minutes before baking. 7.) Bake 8-10 minutes. Don't let them brown. 8.) Cool and move to wire rack to set. Everyone loves Italian food, and nothing smells quite so good as marinara simmering on the stove top. Garlic, onions, basil, olive oil and, in this case, sausage. Mmm. Toss it on some spaghetti, serve with toasty garlic bread and a salad and you have home comfort food or dinner for company. Bag your extra marinara for the freezer or put some aside in the fridge. This recipe will make about 12 cups of sauce. My original marinara recipe comes from my mother-in-law. She uses a tri-fecta of meat to flavor her sauce--stew beef, breakfast and Italian sausages, and homemade meatballs---and cooks it for five to six hours. It's absolutely delicious. With trying to cut back on meat at our house I went for maximum flavor for minimum meat and fat with turkey sausage and extra veggies instead with the carrot puree. I also tried a little experiment on the cook time. We're running low on gas and I didn't want to simmer my sauce for five to six hours. Instead I set aside a quart of sauce that had cooked for just about two and half hours in the fridge and poured the rest into the crockpot. I set the crockpot to low and let it sit overnight. The next morning I tasted both versions and found...that I liked the version that cooked for less time better. Maybe I cooked it for too long or maybe the crockpot just didn't do the trick. One thing Mom does put in this sauce that I had never tried and found incredible was dried dill. Dill gives the sauce a nice fresh flavor. Long story short, if you don't have time to cook your sauce all day and if you want to cut back on meat and add some extra veg to the mix, give this recipe a try. Thanks Mom for your help in learning how to make marinara from scratch. You saved me from Ragu! 1.) Break up the sausage, squeezing the meat from the links. Saute in Dutch oven or large pot until browned. Drain any fat and set meat aside. 2.) Saute onion in olive oil until soft and translucent. Transfer to food processor or blender. 3.) Add cooked carrot to the onion in the food processor and blend until smooth. Might still be a little chunky. Don't worry, it will cook down in the sauce. 4.) Add tomato paste to the Dutch oven and cook for a few minutes. Fill each paste can with water and add to the pot. 5.) Transfer pureed carrot and onion puree and cooked sausage and cook for one hour. 6.) Add tomato sauce and about 1/4 can of water for each. Add all spices and a pinch of sugar. The idea with the sugar is just to add enough to balance out the strong acidity in the tomatoes. I prefer my marinara more spicy than sweet. Adjust spices to taste. 7.) Add parmesan. I use the regular Kraft grated parmesan. Real parmesan grated into this sauce turns into a gloopy mess. 8.) Cook sauce at least another hour. Serve immediately, refrigerate for a week or freeze for a month. My boys get excited when they see the chocolate syrup bottle come out of the fridge at breakfast time, and I love that they're getting lots of protein. Try this shake with a yogurt and soy milk/milk combination if you don't have kefir on hand. Don't tell the kids but I also sneak cooked sweet potato or carrots in this when they're not looking. They've never noticed! For easy cleanup, use an immersion blender like the one pictured below. They have fewer pieces to clean up than a blender. 1.) Place bananas, chocolate syrup and peanut butter in blender cup. 2.) Pour kefir until cup is 3/4 full. Blend until smooth. Serve. For more recipes visit www.feedingfourfood.blogspot.com.